I blogged recently about the upcoming international first-class postage increase, and I (and other blog readers) have been curious about which other postage rates are going up, and by how much. Letters to Canada or Mexico (up to 1 oz.) – 5-cent increase to 85 cents. It is important to note that the U.S. Postal service "Forever" stamps will reflect the current first-class rate. So, if you are using a numbered stamp, or a Zazzle-bought stamp etc and it says 44 cents, you'll need to make sure you add a 1-cent stamp. However, if you're using a Forever stamp, it becomes worth 45 cents so you don't need to add extra postage. All postage released at first-class rate in 2012 will be Forever, and all of the later releases in 2011 were Forever stamps. As much as I miss the numbers, and combining old/vintage stamps to provide the proper face value, I have to admit that the Forever designation is handy and a good value. Use up your 98-cent international and your 29-cent postcard stamps while you can! Gah! I can't integrate all those changes into my head at once! very clever of them to use "adjusts" when normal people would probably say "increases". The international one is the one that hurts me a bunch. Ouch. I have alot of international pals. 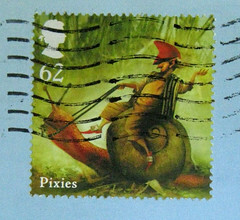 Also means a lot less postcrossing for me. Any idea when we can buy the new international and postcard stamps? I asked at my post office this week if they had the new stamps - no, and no idea when they'd get them. I don't see them on the USPS.com website yet. Hopefully we'll see them soon, but if it's been like some past rate changes, they won't be available until a few days before the change. 32¢ for a postcard? $1.05 for intl. mail? Ouch. No wonder I haven't been mailing much lately. I'm going to have to get actual intl mail stamps at some point - no longer can I put two First Class stamps together and add 10¢ and call it a day. But a booklet will be over $20... This is becoming an expensive hobby. When are they going to reverse the law to put away $5 billion a year for retirement accounts? Stephanie, to your last question - I second that. Bahhumg on them not letting us get them in better advance...not like they don't know the hike is coming. Okay little mini rant over and I third the motion about the retirement. I hadn't heard about this. Yuck! Thanks for sharing. I'd rather this than lose Saturday delivery--which will probably happen too, soon enough. What is it about the Postal Service that drives people crazy! Gas goes up 10 cents a gallon in one day and nothing is said, but let the Postal Service raise the price of stamps one penny and you'd think it was the end of life as we know it. What is it going to cost the average person a year? $1 Let me know if you can find another country where you can mail a letter for 45 cents to anywhere in that country, and if the person at the other end has moved, will said country forward the mail to anywhere for FREE! Nuff said. nolandm - I couldn't agree with your more. Hear, hear!